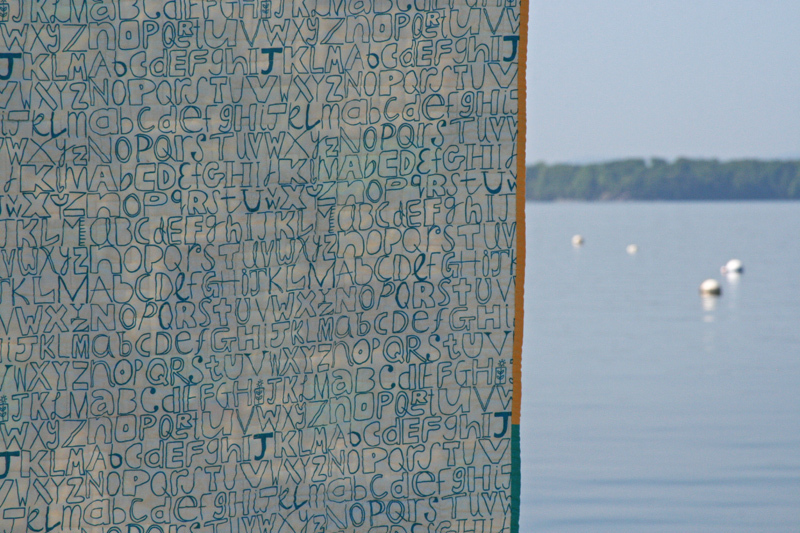 Anyway, I love these Summersville prints by Lucie Summers, and I particularly love it in this lovely blue color. I paired them with a few other blue solids and prints, and just a little pop of orangy-yellow. 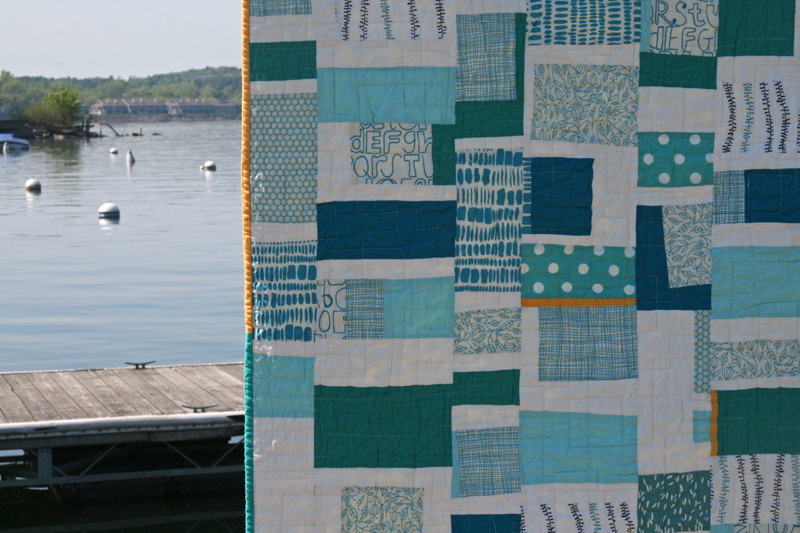 This quilt was totally inspired by this one by Gail Baar, and I love how it all came together. 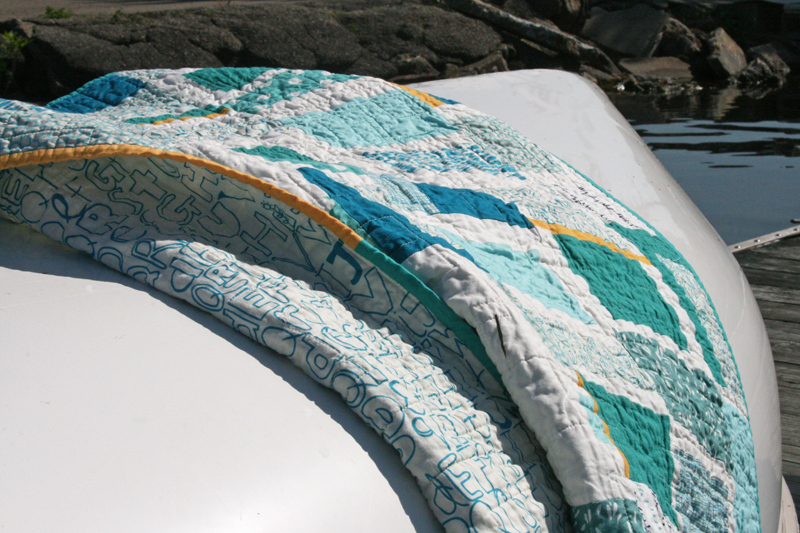 So the quilting…. once again I was inspired by the fabulous Angela Walters. I received an advance electronic copy of her (soon to be released!) book , and if I’m being honest, I’ll tell you that I tend to just keep it open on my computer. Slightly obsessed, maybe? I love looking at her designs, and I love that it gets me thinking about other types of quilting. I went with a square quilting design for this one. I knew that I’d have trouble going with free motion quilting and not making rounded shapes (such a habit!) so I decided to use my walking foot instead. It required a lot of shoving the quilt through the machine though, so if it had been any larger it probably wouldn’t have worked so well. 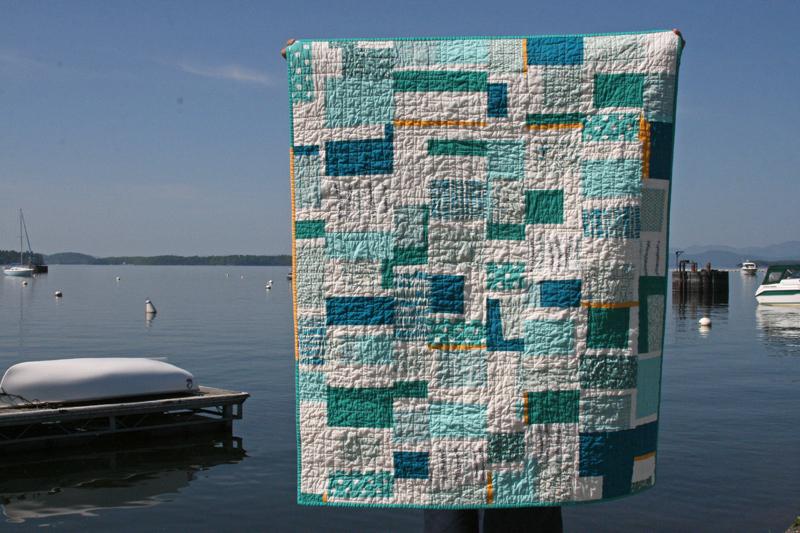 I think the square quilting really complements this quilt design, and gives it really nice texture. 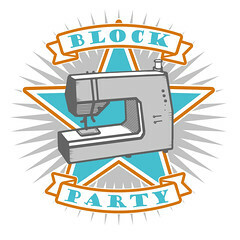 I used Lucie’s Alphabetty print for the backing (I’m a big fan! And in fact, Max has a pair of pants using this print in black, and I just bought the cutest ipad case from Amber in the blue Alphabetty print. A fan, for sure!). The binding is mainly a turquoise solid, with a pieced yellow section. I lost some of the yellow on this side of the quilt when I squared it up, so I thought I’d add a bit in the binding instead. 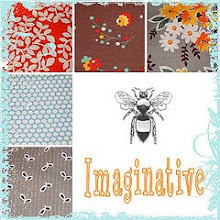 Summersville is available at many shops, including Pink Chalk Fabrics, Fresh Squeezed Fabrics, Nido, Bloomerie Fabrics, Marmalade Fabrics, Whipstitch, Fabricworm, Sew Modern, and Lola Pink Fabrics. 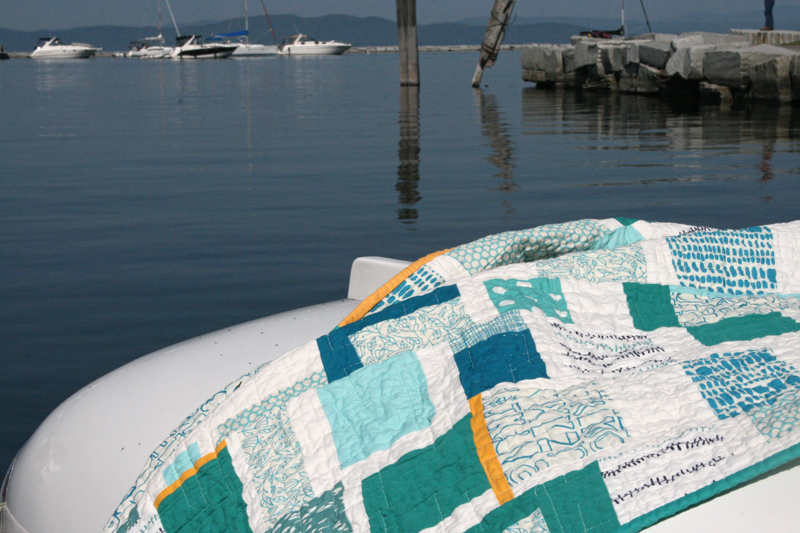 This entry was posted in [search] Wonky/Improv Quilts, Posts about Quilts, Quilts and tagged blue, handmade, improv, lucie summers, quilt, quilting, summersville. Bookmark the permalink. 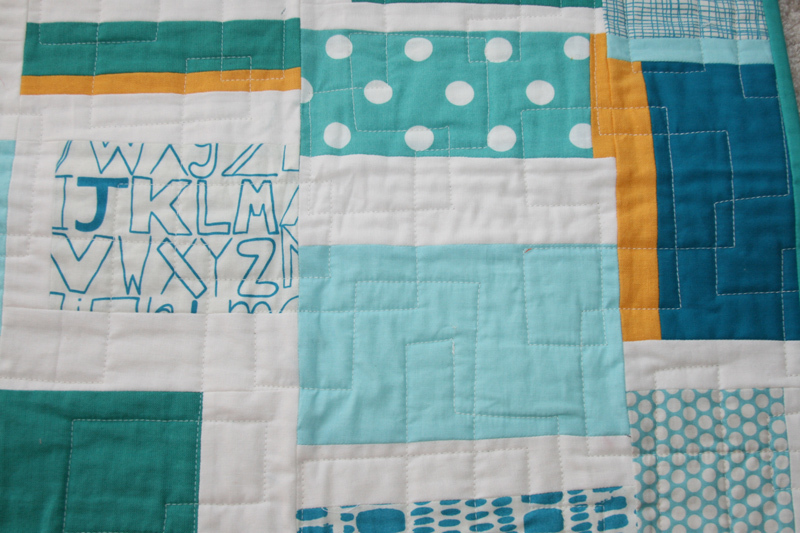 I loved this quilt when you first showed it on your blog, and I love it even more now. This may inspire me to make something just like this, in the same beautiful colors. Thanks for sharing. Love the quilt! This line is very very fun, and versatile. It looks so fresh and crisp. Lovely photos by the water too. Beautiful quilt! It does look like Greece 🙂 with the sea and the white houses 🙂 I like the square-looking quilting on it. Beautiful quilt, I love those colours, and the prints too of course! What a perfect name for your quilt. Love it and I love Greece. Couldn’t think of a better name! Love it!! The colors makes me think of sea glass! The quilting looks great! I would want to do it with a walking foot too. I’d just get so tense trying to keep things straight otherwise. Tell Morgan that there are thousands of fabric dorks. We’re multiplying like rabbits! This is probably one of my favourites that you’ve made….really stunning Ashley! Love it! Those color are beautiful. I love the quilting. I’ve been wanting to try a square style quilting for a while. It really adds a lot! Pretty pretty pretty! Love the colors and photos! i love the color combinations! beautiful! I really love that! It turned out beautifully, and I think you came up with the perfect name. love this line of fabrics and LOVE this quilt. helps that it is made with my favorite color too, but it’s so light and airy. love this quilt a LOT !! What a beautiful quilt. I really like the idea of adding the color back in on the one side with the binding-I’ve added that tip to my knowledge bank-thank you! I love the colors you used and the pop of orange! Can you tell me what type of batting you are using? Love the turquoise fabric. So fresh and summery. wonderful combination of summersville fabrics. very inspiring. Where do you live? The background in these photos looks so much like the Mount Desert Island area where I am from.